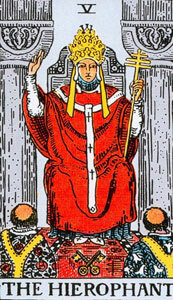 Synopsis: The obvious and long-ignored correlations in the formative and astrological symbolism of the Tarot major arcana. 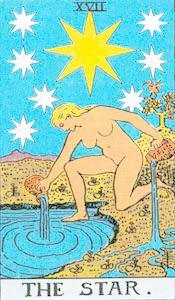 The Tarot extended to the 5 final Hebrew letters. The alphabet of structuration begins with these two signs. 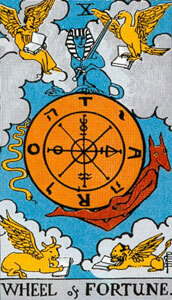 The first, Aleph, designates that which cannot be designated. The second, Bayt, designates the archetype of container, or "house" as in the World becoming a container for that which cannot be contained, or a "dwelling place for G-d". 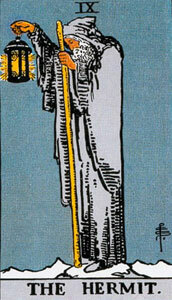 The symbolism is clear: Bayt is the in-dwelling of Aleph. The similarity of the images are unmistakable and intentional. 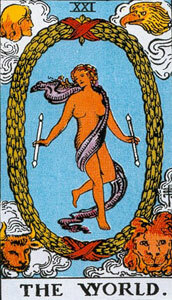 The World contains the Fool, who has shed his divine raiments and traded his single staff for the two wands of duality. This is the first step off the cliff of emanation. 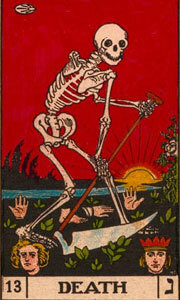 It is hard to be more clear in the language of symbolism. We have seen the torturous rationalizations that are necessary to justify the Magician in the place of Bayt, the house. 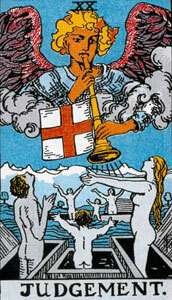 The Magician resembles the Fool only because it is another container of the energies of life-death, (2-Bayt-World contains Aleph), existence (20-Kaf-Sun contains Yod) and their cosmic realization (200-Raysh-Magician contains Qof). 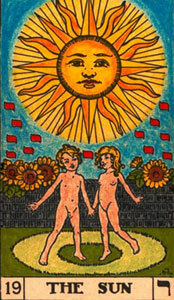 When the Tarot trumps are arranged in their natural 3x9 matrix, we can see not only obvious formative and astrological correlations with the symbolism of the Tarot, but also equally obvious symbolic elements that relate not just to the meaning of individual trumps but also connect to other images in the matrix and indicate rank and position in the sequence. 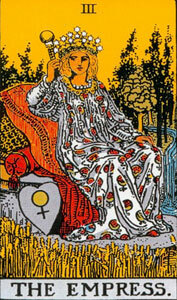 Iconic elements were chosen specifically to connect the dots: posture, clothing, environment, and symbols that are shared by more than one image. 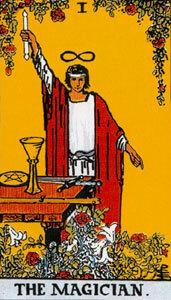 We focus on the first four letter-numbers to see the symbolism of the Tarot trumps and their inner meaning more clearly. When the World is banished to the last trump and the natural sequence of three levels of nine obscured, the significance of the first four trumps are completely missed. They form a logical sequence and describe the first four abstract "pre-cursors" of the process of biological structuration. 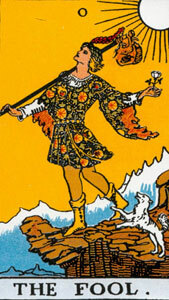 The Fool, life-death beyond thought, is about to "incarnate" in manifestation. To do this, he takes three initial steps off the cliff in front of him: containment, archetypal movement (interaction of container and contained, why there is no human form in this card) and resistance. This sets the stage for the fifth letter, Hay, and life. Note the archetypal symbolism of the first three trumps: they are variously outside of the natural world. 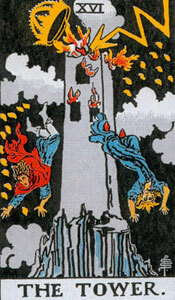 All the cards that follow will be grounded in the material reality brought by the Tower. Now we can follow the semantic development and symbolic correlations of three of the columns of the natural sequence -- 2, 3 and 4 -- through three levels of structuration. We focus on these three because they contain six of the seven double letters and allow for easy comparison. 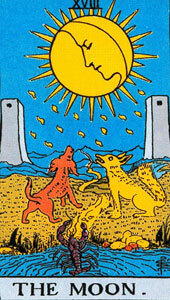 The basic, primitive symbolism from the 15th century Tarot, without the occult overlay, contains some surprising clues about the interrelationships and sequencing of the trump. Containment (2): all the trumps have figures with two arms out from their body, all drapped with a cloth and two of them naked. Of all the trumps, only the child in the Sun shows his open hands (and soles!). Kaf: branch, leaves, palm, sole of hand/foot. Extensions, productivity, fruitfulness. 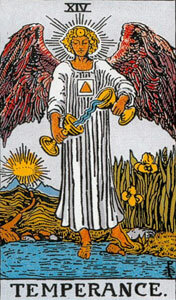 The World, where Aleph, the Fool, next (1-2) appears in its container, Bayt, is the only enclosed Tarot card; the androgyne holds two wands, the wreath has two bindings, etc. It's a container. Movement (3): all the trumps signify motion (Wheel: archeyptal movement; Justice: equilibration, controlled organic movement; Judgment: breath, cosmic movement, resurrection). These are the only Tarot trumps that show motion; all the others are frozen tableaux; but the Wheel is turning, Justice is weighing, and Judgement is sounding. The exception, the Tower, is the response/resistance to organic movement, which contains movement inside it (Dallet-Lammed-Tav). 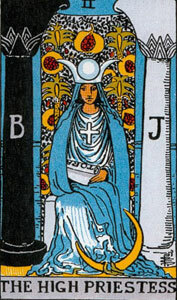 Resistance (4): the only upside-down figures in the Tarot, with the only single central vertical elements (Tower: archetypal active resistance; Hanged Man: T-Cross, organic passive resistance); followed by the High Priestess (wearing a cross ) as the (veiled) santuary of cosmic resistance Tav and its own opposite, Aleph. Tav=Sanctuary. 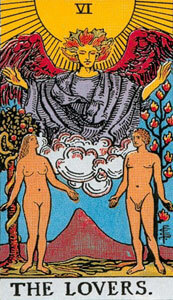 The (two) pillars of the High Priestess are the resolution of the (one) Tower (active resistance) + the (one) tree of the Hanged Man (passive resistance): Jachin and Boaz. The eighth column, where Pay, the last planetary letter lives, signifying unstructured or undifferentiated substance on three levels (the first two shown here). 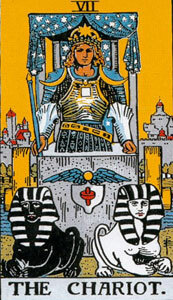 Only two trumps of twenty-two have shields: the front of the Chariot, and the Empress' coat of arms (Venus). 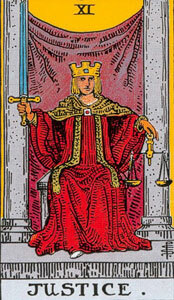 Only two figures hold orbed sceptres in their right hands: The Chariot and Empress (the Emperor holds a trefoil). Three trumps have patterned cloth: the Fool's tunic, the Chariot's Canopy and the Empresses gown. 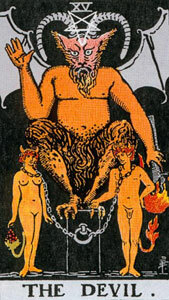 As another level of confirmation of the symbolic code, unexamined by our tarot authorities, we return to the matrix and consider the place and role of the five final (sofit) Hebrew letters, which are varied forms of five of the basic twenty two: Kaf, Mem, Noun, Pay and Tsadde. All of the letters on the cosmic level -- Qof through Tsadde -- represent exalted versions of their counterparts on the archetypal and existential levels. The first four, Qof through Tav, represent the completion of the basic structural energies (Aleph through Dallet) necessary for life to form on every level -- at 5, 50 and 500. The finals are all directly derived from the existential level and not part of the basic alphabet of creation because they are transformations available only when cosmic life (500) is achieved. 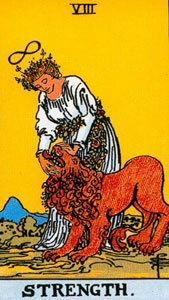 The imagery of the tarot, when correctly organized, is semantically accurate not only for the twenty-two, but also for the full twenty-seven. The Sun, formed by Kaf, 20, represents all the physical supports for existential life. Remember, Kaf in Hebrew means the palm or sole, receptive and supportive areas of the body. The photons we receive from the Sun are a clear example of physical energy fueling and supporting biological life. When life is realized on the cosmic level, as final Kaf (500), it is represented by the energy of Sun, not the Wheel, which bears no resemblance to Kaf at all in terms of its symbolism. In the same trump, we have the Sun of yetziratic formation, a garden, a containing wall, and a child supported by a horse displaying his/her palms and soles (kafs). Hello? 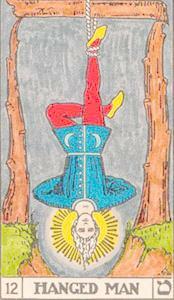 The Hanged Man, transformed from Mem, 40, to Mem final, 600, represents cosmic fertility and the resolution the the male waw and female samekh. 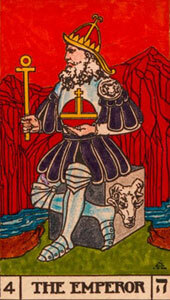 Adam is Aleph, the Fool, in blood (Dallet-Mem). 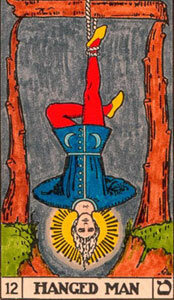 In 600, the blood is "all-absorbing" and the organism can come to radiate cosmic energy (light, the halo of the Hanged Man). 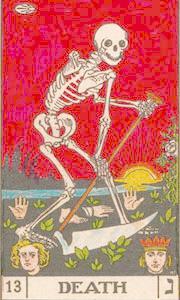 Death, which is existential life, Noun (50) is realized in the cosmic indetermination and freedom of Noun (700). The sevens represent indetermination on every level. The probability amplitude Zayn, 7, becomes a real probability of a measurable state at Ayn, 70 and is realized literally on the cosmic level as the principle of indetermination, without which the universe could not exist. This state of consciousness is impossible without dying to every moment. The last two finals, Pay and Tsadde, are not translations of signifiers across columns, representing transformations into different states, but rather fulfillments of the same state. 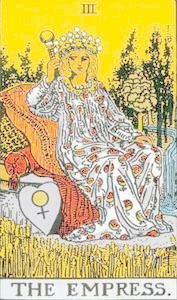 The Empress sits in nature in her wild, undifferentiated state, a vast pool of unstructured and unexpressed energies available for structuration and evolution. 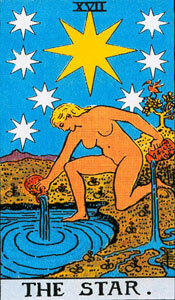 The Woman of the Star dips into this pool to form her structures, which can be repetitive or transcendently beautiful and freely creative in final Tsadde, 900.